The host and a woman a head taller than he walked into a recording studio control room filled with a dozen or so invited guests. Yes, Prince is working with Hill, 31, the Los Angeles singer who caused a sensation on NBC’s “The Voice” in 2013 and also was featured in the Oscar- and Grammy-winning documentary “20 Feet From Stardom” about backup singers. Six selections were played from “Back in Time,” which Hill recorded in two or three weeks at Paisley Park with Prince as producer. “It’s the fastest album I’ve ever made,” he said. 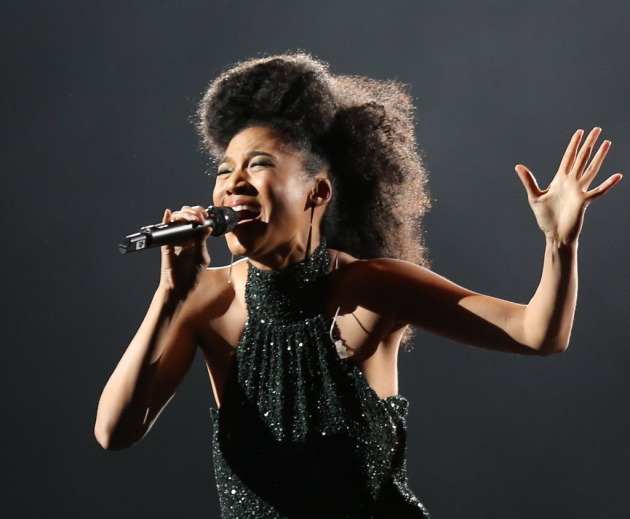 Surprisingly, Prince did not discover Hill on “The Voice” or in the Michael Jackson movie “This Is It,” where she was featured as a backup singer in rehearsal for his upcoming tour. He learned about her when he saw a video clip of her being interviewed on a European TV show and she mentioned that she’d like to work with Prince. During this 50-minute listening session, Prince was remarkably relaxed. He wasn’t putting on airs or playing games. He seemed committed, sincere and proud. He seemed to relish that Hill is a singer with serious vocal chops, not just another attractive wanna-be. Not that Hill isn’t a striking figure, a tall woman in a kimono-like dress with frizzy hair piled atop her head. Hill explained that some of the songs on the new album were written a while back and others more recently. “Turn Up” and “My People” are funk pieces with a more familiar Prince vibe. “That Angel song,” as Prince called it, is a digital-sounding number, with Hill’s strong, soulful, mysterious voice surrounded by synthetic sounds. “Beautiful Life” is a pretty, piano-driven ballad with strings. It's a number that Hill had performed on tour opening for Josh Groban in 2013 but Prince urged her to change it from a minor to major key. Prince then pointed out how Sly’s big, joyous hits like “Dance to the Music” and “Stand” were done in major keys -- and praised Sly as a songwriter, not just a musicmaker and cultural force. While Prince has felt comfortable in recent years as a mentor working with young musicians, he also was seeking knowledge on Sunday from the invited guests. “What’s the most efficient way to get this music out?” he asked, noting that the music-bz landscape has changed..
Rachel Chazin, a digital producer for Fox 9, suggested Spotify. Prince had no idea what Spotify is. So Chazin, who said she’s 23, explained how the online listening service works, with a $10 fee per month or free music with commercials mixed in. Prince liked that suggestion and asked his associate how long it would take to get on Spotify? “One week,” Guy said. Prince said to pursue it even though he was told that Spotify pays very minimal royalities to artists. Getting the album on Spotify might be premature. Hill said she has no release date for the project and is close to signing a record deal. She inked a contract with Columbia Records in 2013 but no album was released. Hill does have a cover photo for "Back in Time":– a picture of her as a young kid at a toy piano. Her mother took the photo. And, no, Hill didn’t play the toy piano on the album. In fact, its whereabouts are unknown. Prince was asked how he felt about making music available on iTunes. So he recounted a dinner meeting he'd had with Apple executives in about 2005. He asked what was the biggest selling album at the time on iTunes. He was told 200,000. “The meeting is over,” he said. He then mentioned that Hill’s album cost a lot to make because it involved many musicians who need to be paid. If she doesn’t get paid, he said he couldn’t afford to keep buying shoes. Radio programmer Jim McGuinn asked if Hill would perform on the Current. Then Prince apologized and said he should have explained that the Current is a radio station. After the Current faux pas, Prince led the invited guests back to the NPG Music Club room at Paisley Park, where about 100 lucky Purple fans had gathered. It was show time for Hill and her six-man band. She tore into “My People,” which was the last song heard in the listening session. Next came a new tune with an old-school jazz vibe and the key line “I wanna love choo choo.” New Orleans funk is probably the best way to describe the ensuing song, which could be titled “Let’s Get Wild Tonight.” Hill played keyboards on “Cry Cry Cry,” which sounded soulful but strikingly different without horns. Still, the slam-bam, 30-minute performance proved that Hill has a world-class voice that has improved since her TV-talent stint -- and a formidable band with a funky bent. Prince never joined her onstage. She didn’t really need him. Twin Cities kids Hippo Campus making TV debut Tuesday on "Conan"